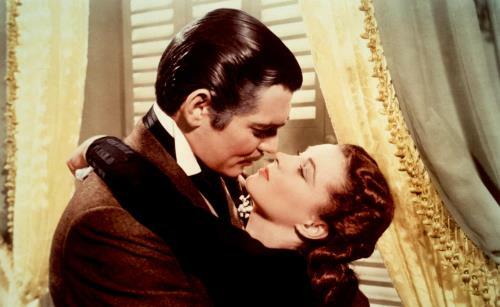 Classic romance drama Gone With the Wind — perhaps THE classic romance drama film — turns 75 and is celebrated with another Ultimate Collector’s Edition, but the set does have some new features. Limited and numbered with new memorabilia, packaging and special features, the Gone With the Wind 75th Anniversary Ultimate Collector’s Edition Blu-ray set includes a replicaof Rhett Butler’s handkerchief and a music box paperweight playing Tara’s theme with an image on top of the Rhett-Scarlett kiss. Also included is a 36-page companion booklet featuring a look at the timeless style of the film, written by New York fashion designer and Project Runway finalist Austin Scarlett, whose signature look reflects the romantic elegance of the Gone With the Wind era. and featurette “Old South/NewSouth,” a journey through today’s South, revisiting the real-life locations depicted to see how the world of the Old South continues to inform life in the New South’s cosmopolitan world. Gone With the Wind is still history’s all-time domestic box-office champion at $1.6 billion. Considered among the best American films ever made, the movie was helmed by Victor Fleming in 1939, the same year as the director’s TheWizard of Oz. Gone With the Wind captured 10 Academy Awards, including Best Picture, Best Actress, and Best Supporting Actress for Hattie McDaniel (Since You Went Away), the first Oscar awarded to an African-American actor. Margaret Mitchell’s Pulitzer Prize-winning novel, on which the film is based, has been translated into 16 languages, has sold hundreds of millions of copies worldwide. Today it continues to sell 50,000 copies a year. Olivia de Havilland (The Dark Mirror) also stars in the classic epic of the American South. On the eve of the Civil War, rich, beautiful and self-centered Scarlett O’Hara (Leigh) has everything she could want — except Ashley Wilkes (Leslie Howard, The Petrified Forest). As the war devastates the South, Scarlett discovers the strength within herself to protect her family and rebuild her life. Through everything, she longs for Ashley, unaware that she is already married to the man she really loves (Gable), and who truly loves her, until she finally drives him away. Only then does Scarlett realize what she has lost and tries to win him back. Gone With the Wind was released as an Ultimate Collector’s Edition for its 70th birthday too, but with different packaging and goodies.